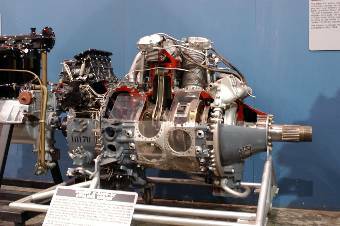 The Wright R-3350 Duplex Cyclone was an air-cooled radial aircraft engine with 18 cylinders arranged in two rows. Bore was 6.125 inches (156mm) and stroke was 6.3125 inches (160mm), as with the R-2600, giving a displacement of 3350 cubic inches (54.9 liters.) It was one of the most powerful radial engines ever produced. However, it required very high octane gasoline (AN-F-33 or 115/45 gasoline) and early models had numerous bugs. The most dangerous of these was inadequate cooling of the upper rear cylinders, which caused valves to burn out and the engine to catch fire. The fire then spread to the magnesium casing around the supercharger, which very often meant the loss of the aircraft. Fuel injection and water injection power boost for takeoff were not added until after the war was over. Aircraft using this engine included the B-29 Superfortress and the B-32 Dominator. It was to have powered the P4Y Corregidor flying boat, but the high priority given to supplying R-3350s for the B-29 forced cancellation of the P4Y.